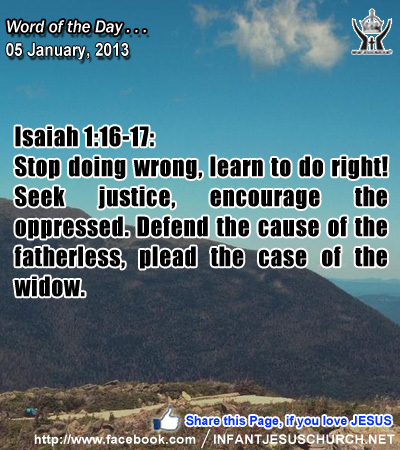 Isaiah 1:16-17: Stop doing wrong, learn to do right! Seek justice, encourage the oppressed. Defend the cause of the fatherless, plead the case of the widow. Heavenly Father, open our eyes today to see those who need your love and give us the thoughtfulness, time, and compassion to serve them. May Infant Jesus' work be seen in our life today. Amen. Jesus' response to Nathanael's new faith is the assurance that Jesus himself will be the "ladder which unites earth with heaven." Jesus proclaims that he is the completion of the promise made to the Patriarch Jacob and his descendants. Jesus is the true steps or stairway to heaven. In Jesus' manifestation, the divine Son of God taking on human flesh for our sake, we see the union of heaven and earth – God making his abide with us and bringing us into the heavenly reality of his kingdom through his Son Jesus. Jesus' death on the cross, where he overcome sin and won new life for us through his resurrection, opens the way for each of us to come into a new association with God as his adopted sons and daughters. The Lord Jesus opens the way for each one of us to "rise to heaven" and to bring "heaven to earth" in the daily circumstances of our lives. God's kingdom is present in those who look for him and who strive to do his will. Through the gift of faith God opens a door for each one of us to the heavenly reality of his kingdom. Do we see with the "eyes of faith" what the Lord Jesus has done for us? Heavenly Father, through your Son Infant Jesus, you have opened the way to heaven for us. As you revealed yourself to your beloved patriarchs and apostles, so reveal yourself to me that we may recognize your existence with us and know the power of your kingdom at work in our life. May we always find joy in your presence and never lose sight of your kingdom.